The Food Justice Project works in solidarity with allies, organizations, and people on the “front lines” of the food movement and struggling for food justice in our region. While there are dozens of food sovereignty issues we would love to support and mobilize towards, our members decided to focus our efforts to some specific areas of the food system and stand in solidarity with our allies. CAGJ mobilizes our members and the public for a fairer food system by supporting small-scale farmers and food producers, farmworkers, the right to good food, food chain workers, and food justice everywhere. On June 5, 2017, the Seattle Sugary Beverage Tax (SBT) was passed by the Seattle City Council, the result of months of community organizing, advocacy, and outreach. G ot Green led a campaign to ensure that the revenue from the tax will go back into low income households and communities of color, which will be most impacted by the tax as they are more likely to purchase lower priced beverages such as soda and other sugary drinks. Got Green and the campaign coalition secured the reinvestment of at least 50 percent of the tax revenue toward programs aimed at closing the food security gap and enabling low-income families and communities of color to access affordable, healthy food; create an oversight Advisory Board with community representation; and grow the Fresh Bucks program — a dollar-to-dollar match program for EBT/SNAP users to purchase fruits and vegetables at Farmers Markets. CAGJ is seeking volunteers this Summer 2017 to continue the effort in closing the food security gap and reaching out to the community! Please join us as we pass out fliers at farmer’s markets around Seattle. For more on how to get involved, contact Simone. CAGJ has supported Got Green’s campaign to close the food security gap as member of their coalition, fundraising at the Green-A-Thon, showing up to meetings, giving a solidarity testimony at the hearing, and supporting Got Green’s awesome Food Access Team! We supported Got Green’s campaign to make Fresh Bucks and Access to Healthy Food a reality for all people. Closing the food security gap means providing access to healthy foods for families on the fringes of the federal poverty level who don’t qualify for benefits like EBT, SNAP, or Fresh Bucks. “To maximize the racial and class equity of this law, diet drinks must also be included in the tax in the future. In the meantime this is a significant a victory by and for working families throughout Seattle because the new law puts closing the food security gap as the number one investment priority for the tax revenue,” says Tammy Nguyen, Got Green Food Access Co-Organizer. Learn more about the Sugary Beverage Tax, it’s impact, and the food security gap by reading Got Green’s SBT flier, and see: Seattle Becomes First City to Devote Sugary Drink Tax Revenue toward Closing the Food Gap. UFCW 21 is our Food Chain Workers Solidarity Campaign partner and CAGJ supports UFCW 21’s New Season’s campaign as coalition member. Grocery workers with UFCW 21 are campaigning to stop the expansion of aggressively anti-union New Seasons, a Portland-based grocery chain that’s building stores in the Seattle area. Despite branding as a healthy neighborhood market, New Seasons actively seeks out locations undergoing gentrification and makes neighborhoods unlivable for those who can’t afford rising rent costs by raising home values even higher. Additionally, New Seasons Market violates many of the job quality standards UFCW 21 and grocery workers have fought for in Washington state by denying employees their basic rights, like a fair sick leave policy and the right to unionize. 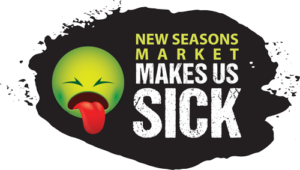 In fact, New Seasons Market employees are punished for taking sick leave, facing termination after only 3 absences due to illness. On top of that, one of New Season’s investors, the Murdock Charitable Trust, has provided millions of dollars to extremist right-wing organizations, including the Alliance Defending Freedom (ADF) and the Freedom Foundation. We call on New Seasons Market to treat their employees with respect and cut ties with investors who fund anti-LGBTQ and anti-worker hate groups! 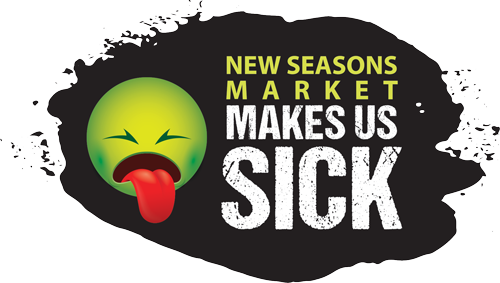 Visit New Seasons Makes Us Sick! to sign UFCW 21’s petition in support of grocery workers at New Seasons Market, learn more about the campaign, and to find union alternatives near you. We supported UFCW Local 21’s Grocery Contracts Campaign in 2016, including a minimum wage increase statewide, paid sick leave, and increased union representation at local grocery stores. We also worked to support Making Change at WalMart and OUR WalMart. Since 2015, CAGJ has been committed to working in solidarity with the struggle against genetically engineered (GE) salmon. After partnering with Friends of the Earth in a successful campaign to pressure Costco to commit to not selling GE salmon, the FDA approved the fish, making it the first ever genetically engineered animal approved for human consumption. 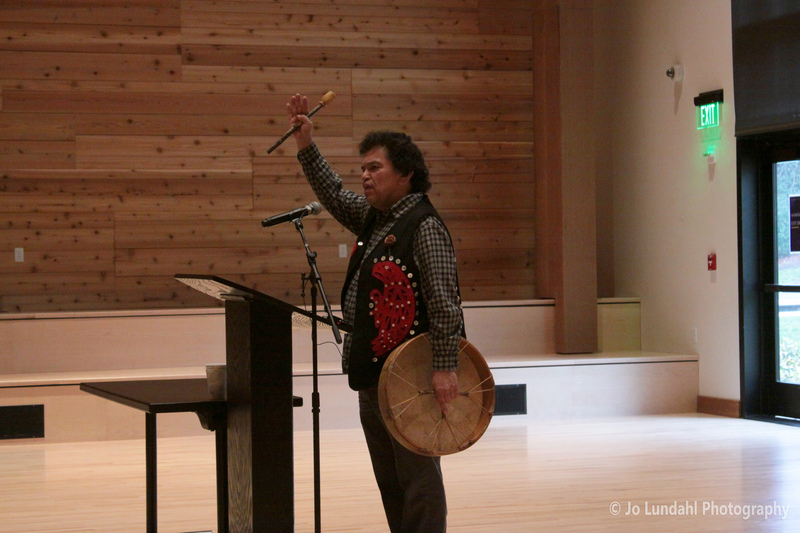 In 2016 CAGJ began its solidarity work with the Muckleshoot Food Sovereignty Project, amplifying the efforts and voices of Northwest tribes in rejecting GE salmon and it’s direct affront to tribal, cultural, ecological and economic well-being. 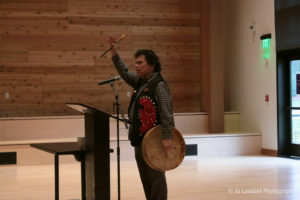 We are continuing to organize with the Muckleshoot Food Sovereignty Project and have begun to strategize with other Northwest Tribes and a coalition of environmental groups towards a Washington state resolution to oppose the FDA’s approval of GE salmon and call on Congress to require GE labeling. We are also working on a short educational film co-produced by The Muckleshoot Food Sovereignty Project and New Canoe Media on Northwest Tribal resistance to genetically engineered salmon. Stay tuned for updates and learn more here! 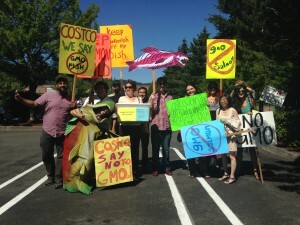 Costco, thanks to pressure from CAGJ and other activists across the country, has said it has no plans to sell GE salmon. We plan to continue monitoring Costco’s seafood sourcing, and are deepening this work by continuing supporting tribal food sovereignty, healthy fishing ecosystems, and more. 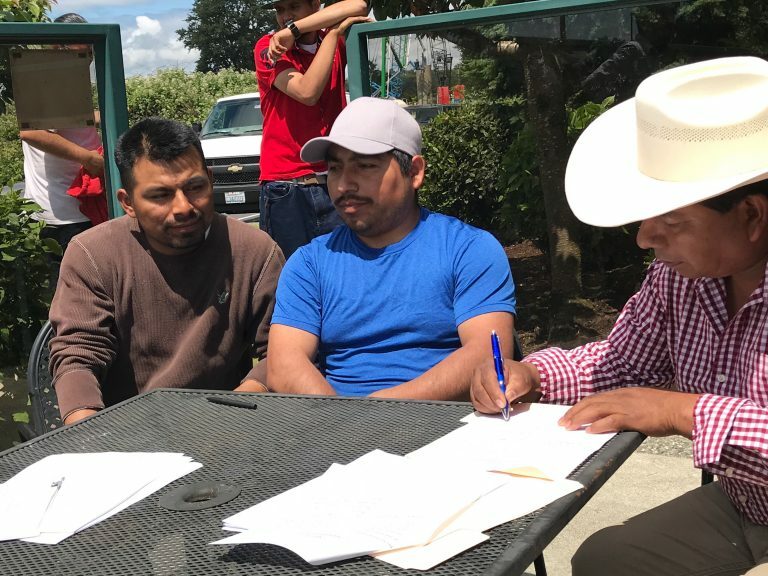 Familias Unidas por la Justicia is an independent AFL-CIO-endorsed farmworker union formed by workers at Sakuma Berry Farms in Burlington, WA. FUJ is the third independent farmworker union formed in Washington state in 30 years and the first union led by indigenous workers, representing over 500 Triqui, Mixteco, and Spanish speaking workers at Sakuma Berry Farms. Since forming in July of 2013, FUJ organized successful boycotts of Sakuma and Driscoll’s berries, won a historic union election to represent Sakuma Berry Farms workers, and negotiated and signed a contract with Sakuma Berry Farms guaranteeing a $12 an hour minimum wage, due process, and union representation. CAGJ supports FUJ as part of our farmworker solidarity campaign. We sat on the Seattle Boycott Committee, coordinated pickets and mobilized support; hosted a victory celebration of the union election at the Washington Labor Council, and have co-organized report-backs, Teach-Outs, and tours to bring awareness about this historic farmworker union. Started on July 11, 2013, FUJ formed out of a series of strikes in response to inhumane production standards, wage theft, racial harassment and other labor malpractices endured by farmworkers at Sakuma Berry Farm in Skagit Valley. That same year, FUJ began a boycott against Sakuma, eventually pulling their berries from store shelves, because of Sakuma Farms’ failure to negotiate. After seeing Sakuma be replaced by Driscoll’s packaging, FUJ boycotted that brand as well, building a massive multinational protest of Driscoll’s and strong alliances with other workers, unions, and supporters, leading to a promise from Sakuma to finally sit down with FUJ. Sakuma stipulated that FUJ needed to hold a worker vote to prove support for the union. On September 12, 2016, in a secret ballot vote of 195 to 58, hand harvesters working for Sakuma Berry Farms overwhelmingly supported the union and guaranteed the start of negotiations between Sakuma and FUJ. On June 15, 2017, 85% of workers voted to ratify a contract drawn up between Sakuma and FUJ. This contract guarantees a minimum wage of at least $12 an hour for workers, union representation, and a fair grievance procedure, among other demands. Now, Familias Unidas por la Justicia plan to set up a cooperative farm in their community, inspire other local farm workers to unionize, and continue to ensure fair working and living conditions by enforcing their contract with Sakuma Berry Farms. Visit FUJ’s website and Facebook page for updates, events, and more information. Read David Bacon’s article, “A New Farm Worker Union is Born,” for a history of FUJ’s organizing. CAGJ joined Washington Fair Trade Coalition (WFTC) and 350.org in a broad international coalition that successfully halted the Trans-Pacific Partnership (TPP), a trade agreement that promoted the interests of large corporations, while ignoring the interests of farmers, food safety, and our democracy. Before the TPP was over with, we gave a final push to our Representatives to come out in opposition. CAGJ produced a poster outlining our concerns, signed on behalf of the hundreds of people who came to our July SLEE dinner. The poster was hand-delivered to Rep. Kilmer by CAGJ interns and sent by mail and social media to all WA representatives involved with the TPP. 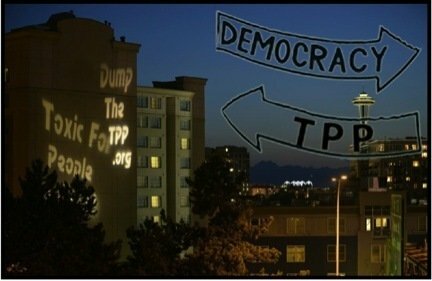 Following the presidential election, the TPP was officially nixed in Congress and declared a dead trade deal. This was an achievement of the long-term organizing by a broad international coalition opposing the failed model of “free trade” that increases profits at the expense of workers, consumers, farmers and the environment. To learn more about the failure of the TPP and the importance of including the public interest, read WFTC’s statement With TPP dead, it’s time to rethink trade and Leaving the TPP is an opportunity to get trade right. Where to next: Now is a moment to present a clear, inspiring vision of trade that puts people and the planet first, as the Trump Administration renegotiates the North American Free Trade Agreement (NAFTA). CAGJ is committed to strategizing with the Washington Fair Trade Coalition, National Family Farm Coalition and others on what goes on the agenda to uphold transparency and accountability to the public interest and prioritize labor rights, human rights, public health, food access, and climate change. With increased targeting, detaining, and deporting of immigrants, we will work for migrant justice in the food system. We stand in solidarity with those most impacted by harmful trade deals, and will work to ensure trade policy works for all of us. For updates on the NAFTA renegotiations, check out Public Citizen’s collection of resources on NAFTA here, and the NFFC statement Renegotiating NAFTA Not a Solution here. We work to support Got Green’s campaign to make Fresh Bucks and Access to Healthy Food a reality for all people. In 2013, we supported the passage of I-522 for farmer seed sovereignty and the right to know what’s in our food. Take action today to support these campaigns and food sovereignty everywhere!